When it comes to giving Uncle Sam his due, we’re dealing with an embarrassment of riches. Want to use an online service to prepare and file your tax return? You’ve got at least five online tax preparation sites to pick from. More comfortable with traditional desktop products? I’ve looked at both TurboTax Premiere 2011 from Intuit and At Home Premium 2011 from H&R Block. And if you’re turning to an iPhone or iPad for an increasing number of day-to-day tasks, tax app makers have something to offer as well. Both Intuit and H&R Block have a stable of iOS offerings aimed at satisfying on-the-go tax preparers. I’ve looked at the major apps from each company, with standalone reviews of Intuit’s mobile tax apps for the iPhone and iPad and H&R Block’s iOS apps. Here, we’ll summarize the reviews of those apps, with an eye toward finding which one best suits your needs. Both Intuit and H&R Block provide similar apps aimed at two types of tax filers—a basic iPhone app that targets anyone preparing a simple 1040EZ form and a more fully featured iPad app that covers more complex situations. 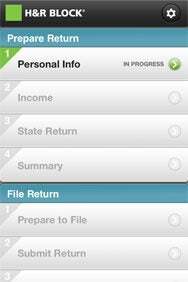 Intuit’s TurboTax SnapTax uses the built-in camera on your iPhone and iPod touch to help simplify the data entry process of filing a 1040EZ return. You snap a photo of your W-2, and SnapTax scans the document to pull out income and other pertinent information. After answering some personal question, you should be able to file your taxes from the app—assuming you’re eligible to file a 1040EZ. Otherwise, the app directs you to the TurboTax website to finish off your return. SnapTax’s W-2 photo scan is a clever feature that worked with varying degrees of accuracy in my testing. On a square-sized W-2, the app pulled in information; unfortunately, much of it was incorrect. On a horizontally oriented W-2, SnapTax only successfully gathered information one out of 10 scans. Fortunately, you can manually correct and enter W-2 information with little effort. 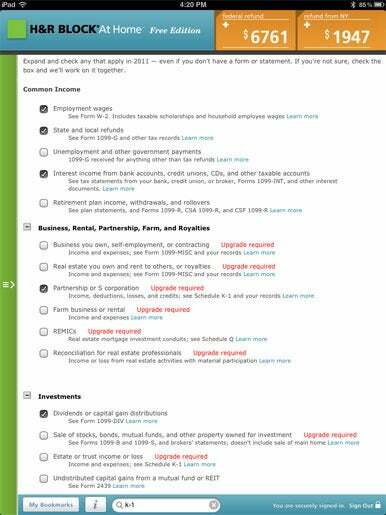 Like SnapTax, H&R Block At Home 1040EZ aims to complete your 1040EZ tax forms. Before you can use the app, you first need to create an H&R Block account. Oddly, if you have an existing account that you’ve created at H&R Block’s website, you will not be able to use that with the app. Likewise, once you’ve converted the smartphone account you’ve created on your phone to an online account, you can no longer use it on your phone. Unlike SnapTax, you can’t finish your taxes on the Safari browser with H&R Block’s iPhone offering. Still, At Home 1040EZ has a distinct advantage over the TurboTax app when it comes to photographing and scanning W-2s: It worked perfectly every time, no matter how my W-2 was oriented. If you know you’ll be filing a 1040EZ, At Home’s more consistent scanning may make it a better choice for simple returns; TurboTax SnapTax does provide more flexibility with its ability to complete more complicated returns online. 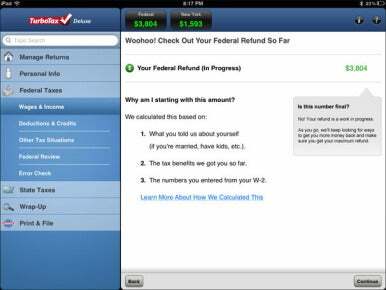 iPad users will find Intuit’s TurboTax 2011 to be an iOS doppelgänger to the desktop version of TurboTax Deluxe, both in features and functionality. Like its desktop sibling, TurboTax 2011 walks you through an interview process that is designed to determine what forms you need in order to file your taxes. Once the interview is over, you begin entering line items for your income, witholding, and deductions. The program worked perfectly from start to finish. I couldn’t automatically import any of my W-2 or banking information into TurboTax 2011—that was also an issue for me when I tested the desktop version—but the overall process was so enjoyable and the data entry was so easy, that fact that I couldn’t import data wasn’t a problem for me. 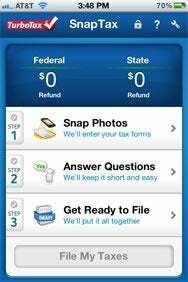 The app is a free download: You only have to pay when it’s filing time. Filing fees for TurboTax 2011 start at $30 for a federal return; if you are required to file state taxes, you will need to pay for a state filing as well. Like TurboTax 2011, H&R Block’s Free Edition is a free iPad download, where you only have to pay at the point when you file your return. At Home Free Edition walks you through a brief personal questionnaire to help determine whether or not your taxes can be completed using the app. While the questionnaire was easy to use, I found that its questions were not as clear or as obvious as the ones posed by TurboTax. In fact, I’d completed my entire return before realizing that I had not entered any K-1 information and that I was also missing some other forms as well. In fact, since these questions weren’t obvious during the interview process, it would have been possible for me to complete and file my return without any clue that there was information I hadn’t entered. H&R Block’s Free Edition supports more complicated tax returns, but the app hides these deluxe features by default. Once I was able to locate the options for adding K-1 information and other similar forms, the H&R Block app made it clear that I was no longer able to use the free version of the app and offered me the option of downloading the other forms I needed. I wasn’t required to pay for anything at the time I downloaded the forms, but the app made it clear that in order to file these returns I would have to pay a minimum of $20. H&R Block at Home Free Edition will do a fine job of handling your taxes, but the onus is on you to make sure that you have completed the interview process in such a way that you have answered all the questions necessary to complete your return. It’s a fine option, but I think TurboTax Deluxe for the iPad seems to be the safer choice for the uninitiated tax filer.